A couple of years ago I quit my job abruptly and decided to work-at-home. My plan? To become a freelance copywriter and make money using Elance, a popular online freelancing platform where hundreds of jobs are posted each day. Taking advantage of a freelancing platform like Elance seemed a no-brainer to me, because real, paying clients were already there, looking to hire someone who could help them. Instead of goofing around with cold calling, networking, and marketing myself online (not to mention good old-fashioned prayer), I could just start applying for jobs that very same day. Which is exactly what I did. And I’ve never looked back! I’ve been able to pay the bills and then some with my Elance income since day-one. And given that I started with no formal experience or training whatsoever, I think that earning money on sites like Elance is something that just about anyone can do. 1) I looked for jobs I could do without previous experience. Many of the jobs posted daily on online freelancing sites don’t require the expertise of an established professional. 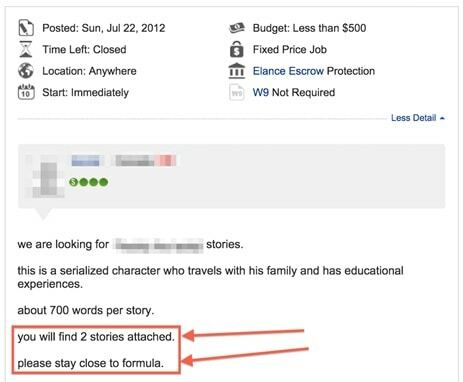 For example, anyone can write a blog post like the one you’re reading right now. If you look closely, you’ll see that the client’s post itself gave me all the info I needed to do the job. The stories they needed were short, super simple, and followed a clear formula that was easy to replicate; in short, the main character was a boy who visited famous places and always learned three things about them. The client even gave me topics to work with, so essentially all I had to do was search Google for some cool facts about each destination, and plug them into the story’s template. I made $340.00 writing these fun little stories in my first days of freelancing, and I was stoked! There are plenty of other jobs on Elance (and other sites) that can be done by any conscientious person with an eye for detail, including proofreading jobs, virtual assistance, research, and lots more. 2) I “went steady” with Elance. Most people make a detrimental mistake when they start freelancing online. That is, they find work from multiple freelancing sites simultaneously. On the surface, the thinking behind this move appears to make sense — having accounts at more freelancing sites means more potential job opportunities. But there’s one fatal flaw with this approach: online freelancing sites reward focus. Why? Because, building up a good solid working history — along with good reviews from lots of clients — helps you win better-paying jobs, with less effort. Naturally, all else being equal the client is going to choose the freelancer with more positive reviews. I took advantage of this simple fact by using Elance exclusively, rather than diluting my results by freelancing on multiple sites at once. It wasn’t long before my jobs history was more impressive than my more experienced competitors. Why anyone can start making money freelancing right away. Once upon a time, freelancing was hard. There wasn’t much work to go around, and the competition was fierce. But today, sites like Elance have made freelancing one of the best ways to make real money online. Thousands of jobs are posted each day, and snagging enough of them to make a nice living is very doable if you’re willing to go the extra mile. I did, and it paid off big-time for my family and me. If you’ve been looking for a reliable way to make money from home doing something you enjoy, I hope you’ll give online freelancing a try. You and your family deserve a big piece of the pie too. Danny Margulies is a copywriter and 6-figure Elancer on a mission to help parents earn great money from home. Get his top 5 Elance hacks for free here. Check out Danny's blueprint on how to become a copywriter. I’m very interested in copywriting, editing, and proofreading and have checked out sites like Upwork in the past and noticed that competition is very stiff. There are so many seasoned freelancers (from other countries) who are willing to work at such low wages that it is very discouraging for someone like myself who has no real experience to compete and much less earn a viable living. What’s the secret? Do I jump in by underbidding everyone else just for the sake of getting feedback? I have been on Upwork a few times and applied for a some gigs but never got hired. I read all these wonderful posts about people making a living out of freelancing full-time but it seems like a strike of luck to me. I have a blog which I link for potential clients to peruse my work and writing style. Danny, what am I doing wrong? I’m a copywriter for 8 years in the biggest advertising agency in my country, thinking about going freelance. English is not my first language and I just wanted to ask how this will affect me if joining sites like Elance. Hi Lilith, Upwork (formerly Elance) uses a global workforce. Having good communication skills (no matter what language you speak) is going to be essential. Upwork may have gigs from clients in your country. You can create an account and see what’s available. Good luck! Great article and wonderful advice, especially how you recommend not “bouncing around.” Consistency is definitely key when becoming a successful freelancer! I am very interested in working at home. Thank you. Hi Teresa, I removed your phone number, so that you don’t receive junk calls. Check out this post — it will give you a good place to to start. https://www.theworkathomewoman.com/right-job/ Let me know if you have specific questions. Good luck! I am very interested in freelance writing; however, I have never done any freelance writing before. 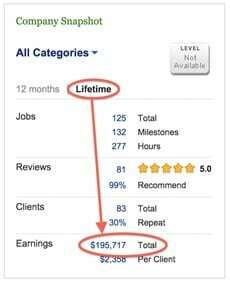 I am making 6 figure earning on elance from last 5 years & 88% of my earning is coming from repeat clients. Remember always focus on building relationship with clients instead of delivering single job to each one of them.